A small junior college in West Virginia has launched a pilot program that combines the open source learning management system Moodle with the immersive virtual world Second Life. The combination has allowed distance learners to create an avatar in Second Life and attend classes through the virtual world. It's proved highly popular, and, though in the early stages yet, the indication is that it's helping to build a connection between Huntington Junior College and its non-traditional student base. "What we're obviously looking at is retention," Assistant Director Cathy Snoddy said. "How do we make that online student, who is separated by time and space, still connected to Huntington Junior College?" 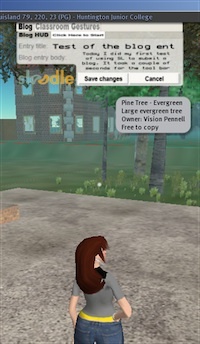 The integration between Second Life and Moodle is called Sloodle and is itself open source. At Huntington, Sloodle is hosted by Moodlerooms, which provides hosting, management, and support for Moodle users. The tight integration between Moodle and Second Life allows students to attend classes, blog, give presentations, and chat with fellow students, all within Second Life, while their entries are posted back to Moodlerooms. It's still early in the experiment, but Snoddy said she's convinced that the Sloodle offering has helped keep students at Huntington--and at very little cost. In fact, the college's experiment with Sloodle met with such enthusiasm that Huntington is rolling it out to all of its distance learning classes shortly. A small private junior college with about 1,000 students and some 50 faculty and staff, Huntington serves residents of West Virginia, Kentucky, and Ohio through eight two-year associate degree programs and three diploma programs. Most students are non-traditional learners who fall outside the 18- to 24-year-old model. Still, students in the pilot classes have adopted the Sloodle technology readily, Snoddy said--despite the fact that many are older than 35, an age group often characterized as reluctant to embrace new technology. One of the college's big successes with Sloodle so far was a pilot class on the culture of the deaf. In the course, hearing students at Huntington were encouraged to interact with the deaf and hard of hearing through Second Life, meeting and text chatting through highly creative individual avatars in an area of Second Life dedicated to deaf culture. "It really brought outside experiences into the classroom," Snoddy said, in a way that wouldn't have been possible without the virtual world. "It was a wonderful experience for students." The classes in Second Life have been such a hit that some students who had been distance learners throughout their college careers commented that participating in Sloodle made them feel truly part of a class for the first time. "We got lots of positive responses and anecdotal evidence," Snoddy said. "Some [long-time distance learners] said, 'This was the first time I have truly felt that I was in school, because I had a virtual classroom to go to.' They had a classroom where they could [come in] and ask questions and raise their hands and talk with others." The pilot program with Sloodle began a year and a half ago, when the college was looking for ways to appeal to and retain students in a highly competitive atmosphere. At the time, the vendor hosting the college's Moodle platform didn't support Sloodle. Huntington has since moved to Moodlerooms, which recently released a Sloodle environment that makes integration with Second Life even easier. The integration with Moodlerooms provides a number of benefits in terms of creating a classroom experience for students, Snoddy said. Students can be within Second Life and blog about their experiences. Blog comments are posted back to Moodle for other students to see, also allowing teacher grading and feedback. Students can meet in Sloodle for synchronous chats and can give or attend presentations prepared in Microsoft PowerPoint. (Second Life converts PowerPoint slides into images, which can then be uploaded into the Second Life background for display.) With Sloodle, scores from quizzes taken in Second Life can be sent back to Moodlerooms. Online classes at Huntington are asynchronous--students aren't required to attend at a given time. Using the Sloodle recording tool, however, live chats in Sloodle can be recorded for students to listen to at a later time. With the pilots behind it, Huntington is now beginning to integrate Sloodle into all of its online courses. Snoddy said she knows of at least five online instructors at Huntington who "are chomping at the bit" to get started with the program. Using controls in Second Life, the instructor or school can elect to restrict access to an area to just those students who have registered for a class--or can leave that aspect uncontrolled, so that students can wander freely and experience the virtual online world at will. Beyond staff time, setup costs were tiny for the junior college. Snoddy coordinated all the beta tests, with help from an instructor and an IT staff member. The IT department helped build the classroom the college uses, but, Snoddy said, it isn't difficult; she said she found the Second Life development group extremely helpful. "We just reached out to the community of developers and tried things." The largest expense was finding land in Second Life. Colleges and universities typically either buy an "island" of their own or rent land from someone else. After first renting, Huntington ended up buying a plot in Second Life, then building its classroom there. The cost of a private island for educators is $1,800 a year--$700 initially plus a $147.50 monthly fee. Has Sloodle increased student retention at Huntington? The deaf culture class showed a 10 percent increase in student retention, but Snoddy said that based on a single class, so there's too little data to show any correlation. While it's too soon to measure the exact impact, Snoddy said her numbers and feedback from students already show extremely high participation in the Sloodle classes. "Students want that kind of engagement," she said.